Groundbreaking research presents credible estimates of the total parking supply in several American cities, and it's not pretty. Satellite images with surface parking highlighted in Philadelphia (left) and Seattle (right), via the Research Institute for Housing America. Parking spaces are everywhere, but for some reason the perception persists that there’s “not enough parking.” And so cities require parking in new buildings and lavishly subsidize parking garages, without ever measuring how much parking exists or how much it’s used. Now new research presents credible estimates of the total parking supply in several American cities for the first time. The report from Eric Scharnhorst at the Research Institute for Housing America, an arm of the Mortgage Bankers Association, provides city-level evidence of the nation’s massively overbuilt parking supply and the staggering cost to the public [PDF]. The conclusions bolster the parking research pioneered by UCLA professor Donald Shoup. Scharnhorst used satellite imagery and tax records to tally on-street parking, surface parking, and garage parking in five cities: New York, Seattle, Philadelphia, Des Moines, and Jackson, Wyoming. The method can be replicated to measure parking in other cities, he says. 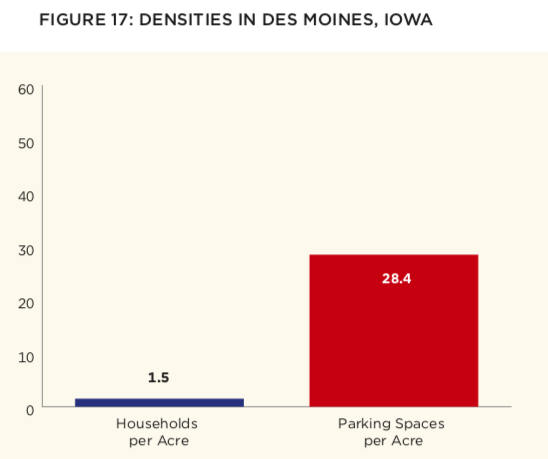 In Des Moines, for example, there are 18 times as many parking spaces per acre as households — 1.6 million parking spaces and about 81,000 homes. In Philadelphia, there are 3.7 times more parking spaces than households. Of the five cities, only New York has more households than parking spaces, and New York still has 1.85 million parking spaces. Much of the parking in the central districts of these cities — the places with the best access to jobs — consists of garages, the most expensive type of parking to build. 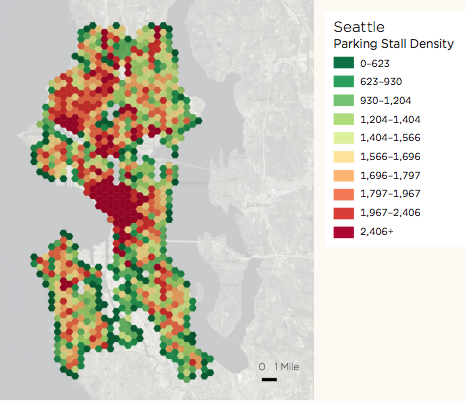 In Seattle, one-third of the city’s parking supply is located in downtown garages. Despite occupying such valuable land, many spaces in these garages sit empty. Scharnhorst reviewed prior research to gather data on parking occupancy in the five cities. In Seattle, the parking occupancy rate downtown is 64 percent. So much for the belief that there isn’t enough parking. In Des Moines at mid-day, one publicly-funded parking garage is just 8 percent full. Outside downtown Seattle, occupancy rates are as low as 43 percent. Only in New York City are some parking facilities close to fully utilized, and even there it’s only the cheaper ones. All this parking spreads destinations farther apart, making walking, biking, and transit less viable and further entrenching car dependence. Parking is also extremely expensive to construct and maintain. If you built all the parking in these five cities today, Scharnhorst estimates it would cost $81 billion. It’s a damning picture of America’s huge misallocation of resources to car storage. The lending industry has been a big part of the problem, insisting on outdated parking formulas as a condition for financing new construction. The fact that this report was commissioned by mortgage bankers indicates that the industry may be ready to change its standards. Parking inventories like the one Scharnhorst compiled for his report can lead to better decisions about parking construction, replacing the current system where parking is mandated by zoning codes based on guesswork and pseudoscience, and where the assumption is that everyone must be able to drive and park at every potential destination on the busiest day of the year. Scharnhorst concludes that cities should change course, and that in places with excessive parking developers should “allocate capital to non-parking uses” — a.k.a. housing, commercial buildings, and, in general, the sorts of things that make cities habitable for people instead of cars. Existing, outdated parking requirements mostly ignore all of these. There should be absolutely no parking requirements. They amount to an unfunded mandate on real estate developers. The amount and cost of parking should be dictated by the free market. Cities shouldn’t interfere with the free market by offering free curbside parking. Curbside parking either shouldn’t be allowed at all (my personal preference), or it should be charged for at whatever rate the market will bear. Parking economics are really distorting. In my rust belt downtown, a well-located acre of downtown parking lot is worth about $5 million based on recent transactions – it’s priced as a business. Any developer is going to want to do a project that’s about 10 times that price to justify underlying land price. So the development economics simply don’t allow going from surface lot to pleasant townhomes and small apartments. It has to be a mid-rise or taller to justify the land. The problem with those conditions is that new mid-rise developments costs 300-400/sq ft in a city where square footage is much cheaper than that. That model doesn’t pencil. Lots of development is occurring at the edge of downtown where low-rise can be done in the 150-200 sq ft ballpark. So the options are: a) do nothing and hope the local economy becomes so vibrant that lots develop to mid-rise or taller. b) actively try to reduce the underlying value of the downtown parking lots, thereby improving the development economics to actually get things built out in our lifetimes in the core of the city. I’d love to see the data on Phoenix, AZ. In the recent transactions, what are the new uses for those parking lots? One possible to answer to that is to just tax the land as if it had been developed to the maximum limits of zoning, regardless of what’s actually built on it. That would incentivize those holding land currently used for parking lots to either develop it or sell it. The flood of land for sale would tend to drop prices, hopefully to the point where low-rise development would be economically viable. > They amount to an unfunded mandate on real estate developers. Well, if the developer is making a profit, they’re not losing any sleep over it because they’ll just pass the cost on to the customers. While I agree with this article in general, it should be noted that low occupancy may result from pricing strategy as well as excess supply over demand. Those who charge for parking may decide that it’s better to fill half the spaces and charge more than twice as much, than to fill almost all the spaces at a lower price. One need only look to the NYC bicycle parking mandate to see that in action. In order to not have to deal with bicycles and protest the mandate, any garages priced bicycle parking so high they barely have any occupancy. Edison Parking, where I park the bike, charges a dollar a day, and has to turn away customers. The advantage to price controls is that it’s a slower implementation. Today, only the most prime lots would be impacted. Those would sell off and be developed, taking capacity with it. It would just snowball over a couple decades, until the off-street parking is only in the most marginal locations. It’s also be politically easy. Ultimately, most are just sold and stay as parking lots. A couple have become 15-25 story glassy buildings in the last decade but they only occurred because of unusual circumstances (one had public money, the other was a cheap lot but the state moved an interstate on ramp and it became valuable). Another is get developed by a college at only 7 stories (they aren’t profit motivated). And the last one I can think of is getting developed into 8 story condos but it will also have $70M electric substation built into – basically a really weird deal. This would be a typical fact pattern. Extremely prime parking lot is bought downtown, very vague plans are conceptually passed for a 20+ story building that will never be developed because the lots cashflow nicely. I think pricing is a bit more complicated. My building in downtown Seattle contains many floors of accounting and legal firms that provide free parking to their employees and comp parking for customers. So individuals aren’t paying the direct costs. In one sense it encourages driving but on the other side when employees decide to take transit/bike/walk/work from home or whatever, their reserved spots in the garage remain unused. On most weekdays our garage is closed to public parking as most of the non-reserved available spaces are taken but maybe 60% of the reserved spots are occupied. It’s kind of like watching a pro sports game when you see hundreds or even thousands of empty seats in the most expensive sections while the cheaper sections are completely full. If corp. seats go unused they rarely bother to sell them or don’t have the procedure in place to sell them. You will soon, probably by the end of this fall. I am a researcher leading a study to quantify parking in urbanized Maricopa County. Sadly this article commits a fundamental error by failing to effectively understand the difference between parking garages and surface parking lots. The author does manage to mention that, “In Seattle, one-third of the city’s parking supply is located in downtown garages,” which totally sidesteps the reverse argument: fully two-thirds of Seattle’s parking capacity is *not* is downtown garages. 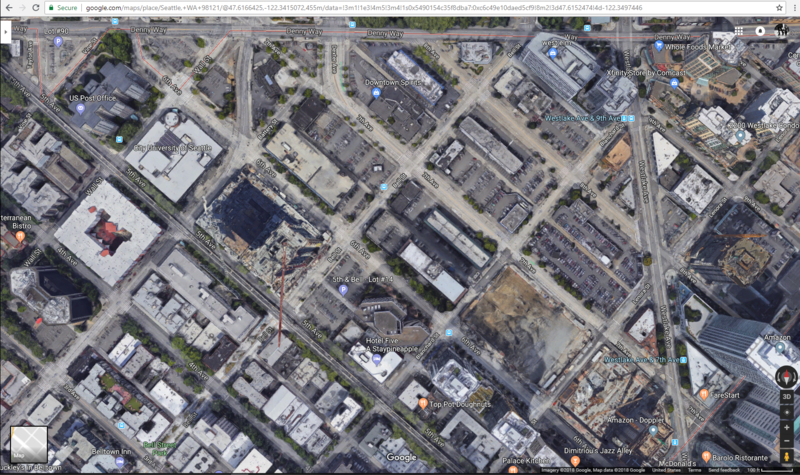 Listen, I lived at 5th Ave & Wall Street in Belltown, Downtown Seatlle from Dec 2012-Sept 2014, 2-3 blocks from Amazon’s new corporate headquarters. a huge percentage of the neighborhood was surface parking lots, *not* garages, which can potentially utilise space at a rate many multiples of a surface lot. Yes, of course, “Much of the parking in the central districts of these cities — the places with the best access to jobs — consists of garages, the most expensive type of parking to build.” What a ridiculous non-point to make. Would you rather they build more surface lots, instead of garages on the most expensive land in the region?! Most of that land could have been used for better purposes, but cars aren’t going away anytime soon, even if we eliminate parking requirement for new construction. Sounds like a good problem to have. Try scooters, they take up less space and are more fun to drive. Scooters also solve the problem of being alive for too long. The difference between private car parking at your own home and public parking for those coming into the area must be clearly examined. Is there multiple car ownership within a family? If so where do these cars get put ? Then how many people drive into the area (for work or shopping etc.) Do business buildings and stores provide parking for their workers/customers ? Is there a viable public transport system ? So much is left out of this report. The whole place is a parking lot. I actually did a parking inventory for downtown Raleigh, NC. The city is currently undergoing a serious parking crunch where there isn’t enough parking to meet demand. Admittedly part of the problem is that parking spaces are reserved with peak occupancy in mind, so a deck might be 100% reserved but will only be at maximum capacity once every few weeks. Cars also solve the problem of being alive for too long. Other cities that have eliminated parking requirements prove that, yes, cars do go away rather quickly. Price control (minimums) has similar impact as taxing the land. The problem that I am trying to solve for with maximums is the development gap in downtowns where the parking becomes so valuable that incremental development (parking lot to a modest building) is not financially possible. Under these conditions, development becomes a binary outcome: either an out-of-scale development or a vitality sapping parking lot. Neither of which are great outcomes for the city. What would happen is that the most prime locations used as parking today would tend to be developed (at least at a rate faster than currently) and at a scale that’s likely to be more consistent with the existing neighborhood. Off street will either be under-priced or accurately priced, while on-street will either be overpriced or accurately priced. Net, it shouldn’t induce demand beyond where it currently is, but improved cashflow would be going to the city with less to lot owners. You could either create parking regs or even tax the parking. This has the effect of making the parking use less valuable, thereby depressing land value to the “highest and best use,” which would become development. A form based code could also help achieve the incremental/fine-grained pattern you’re looking for, but is this the best use in the center city? In short, yes I think that’s a desirable outcome. In terms of form based code – I don’t think that is necessary. I am just pointing out that if the choices that make sense financially are a sheet of asphalt or a 20 story building in a 4 story neighborhood, something is probably broken with that system. Downtown parking economics seems very broken, in many ways that favor lots. It’s just creating distortions in our land use. Cities have a limited toolset they can deploy plus a political system. That’s why I think this is the best solution at the time. Not as efficiently as scooters. Are these spaces long term contracts? All of them? Is there a method by which the city controls the price on these? ‘Crunch’ or ‘shortage’ would seem to indicate that the set price is too low. Was this discussed within the context of your inventory? How was demand determined? I would be interested to hear your thoughts. That was one part of the discussed solution, part of the problem is that one of the largest owners of spaces in downtown is the state gov. I can’t recall exactly what the cost of a permit was but it was incredibly cheap, and they had something like a two year waiting list to get a permit. We had approached them about raising the cost of parking but they insisted there was some sort of policy or legal reason why they couldn’t raise their parking cost. The city does own a lot of parking spaces and I do believe that they are going to try to raise the cost to free up some spaces. The “crunch” is that the city promises to reserve parking spaces in their decks for new office developments on Fayetteville Street, a tower is currently going up and the city does not have enough parking spaces to accommodate them, they locked up the spaces they did have available in advance and now people are struggling to find permitted parking elsewhere. Never ceases to amaze me how Americans are rabid capitalists in all things other than parking. Your anecdote is an excellent case in why this fails so miserably. Angie, you can rest assure that included parking is not required for new developments in Baltimore. And parking has become such an anathema that a pending city council bill, complete streets , includes narrowing city streets for bike lanes , removing on street parking Now that should warm the cockles if your heart. Baltimore is so progressive! And that’s exactly what they do, and one reason why new housing is so feckin’ expensive! Yep, that’s how capitalism works. That’s how bad policy distorts the market. This is a problem because while parking may exist they exist in the wrong spots. Nobody wants to talk 2-3 blocks to and from their car. you don’t know the situation in India. Parking minimums make cities less walkable and less affordable. While many American cities are scaling them back, Buffalo is the only one to eliminate them citywide.